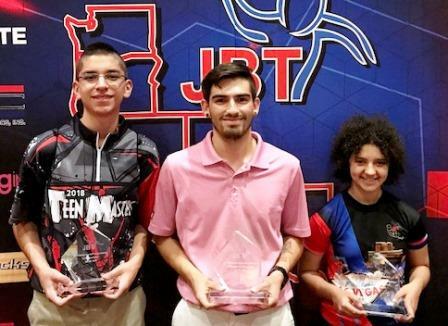 Kyle Duster and Yael Salama earned the most prestigious titles of the JBT season, capturing the scratch and handicap divisions of the 2018 JBT Touring Players Championship, hosted by Strike Zone in Henderson, NV. Orgeon's Ryan Nikolas began his third consecutive TPC stepladder finals with a 255-237 win over Yael's big brother Solomon Salama. Scores remained blistering in the semifinal on the previously brutal lane pattern, as Nikolas poured on the strikes in a 269-239 win over Junior Gold runner-up Jacob Mullen to advance to the title game. Top seed Kyle Duster used a 300 game on the third of the event's four lane patterns to vault into contention, then held off Mullen for the tournament lead in the final matchplay game. In yet another well bowled game, Duster capitalized on a great look for a 247-222 win. Duster already won the So Cal Invitational this season, and caps off the dream summer with his 19th career JBT title and $2,141 in scholarships on the weekend. There will not be a 4th straight TPC finals for Nikolas, as he ages out after this bittersweet finish, but what an incredible run for the 19-time JBT champ and all-time Pac NW great. Scores were also tremendous in the handicap stepladder, beginning with another Oregonian, Isaac Mailkoff, defeating New Mexico's Kara Thompson 234-229. Washington's Colt Jance then came out of nowhere with the back four strikes to edge Mailkoff 222-215 and advance to the title game. Yael has already had one of the great moments this season with her win back in November in San Diego. After leading the early rounds on tough patterns, some thought she might be caught on the more scoreable patterns, but she instead extended her lead during those rounds in the performance of her life. Unfazed by the tension of a major title match, she defeated Jance 241-212 in the finale for the win, second career JBT title, and $2,200 in total earnings after bonuses. The U17 finalists also put on a high scoring show, with Dawson Reese out-striking Deo Benard in the semifinal match, and rapidly improving Andrew Guba turning the tables on Reese 258-218 to win the U17 subdivision and $400 bonus. Scores were a bit tamer in Priority Girls Scratch, with Aileen Linares beating Reagan Lorey in the semifinal, and then falling to Kaylee-Am Khong in the final. 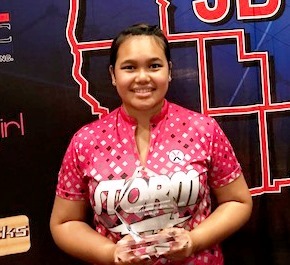 Kaylee needed an 18 fill in the tenth and went strike-spare to add the Girls Scratch TPC to her three Girls Invitational wins this season to cap off an incredible performance in this subdivision. An amazing Celebration Dinner Saturday night was a highlight of the weekend, as were the 300 games by Duster and Evan Smith, who adds her first career perfecto to her already stellar TPC resume as the 2016 champ. Huge thanks to Jerry, Brian, and the team at Strike Zone for hosting, our incredible sponsors Ebonite, Priority Girl, MSC, Logo Infusion, and others for a big prize fund boost, and everyone for attending this very special event featuring the best of the best really showing their skills. Make sure you bowl plenty of JBT events next season to qualify for the 2019 TPC!